"Something is ROTTEN in the city of angels!" MPAA Rating: R for violence, sexuality, and language. I think it's become a universal law that, at any one time, at least 1 new film based on a William Shakespeare play must be touring a film circuit, somewhere. Otherwise, the Earth goes into a sort of hyperdimensional void that can only be escaped with another film version of The Last of The Mohicans. I also recently read somewhere that the combined theatrical gross from all of the major films in the last 10 years based on works by Shakespeare was LESS than the total profit of all the Ernest movies. Despite this, filmmakers keep turning to these classic stories for inspiration, guidance, and obvious attempts at critical praise. Sometimes, the result is a resounding success, as is the case with Let The Devil Wear Black, a deceptively stupid looking crime thriller that's actually a smart, stylish update of Hamlet with strip clubs. As the film opens, young Jack (Jonathan Penner) is despondent over the death of his father and the fact that few people seem as upset as he does. His mother (Jacqueline Bisset) seems somewhat unsympathetic, and he must now share a piece of his father's business with his scheming uncle. The family business is based around bars and lounges. Jack now owns most of these bars and strip clubs and soon discovers that they are worth far more than he previously suspected. Drowning in his own misery, Jack starts having visions of his father. In these visions, he receives clues as to the real cause of his father's death, and they point to his uncle. Meanwhile, Jack's girlfriend is also psychologically unstable, and his best friends reveal themselves to be drug dealers. In one evening, though, Jack will get to the bottom of things and figure out how to get revenge for his seriously screwed up life. Devil is certainly clever in its modernization of the classic story. Even though Jack is a philosophical, morbid sort, he certainly isn't the Hamlet we all know and love. He's more violent and passionate, not to mention weird. His girlfriend, Julia, makes the original vision of Ophelia seem tame and remarkably sane by comparison. Making the entire set of characters these sordid, modern caricatures adds a whole new twist to the usual interpretation. Not everything from the original Hamlet is completely translated; a few things have been changed, added, or omitted to make it interesting, but the core story is definitely present. Wisely, Devil avoids the pitfalls of many modernizations of Shakespeare works. None of the characters have witty names that reference the play, like 'Mr. Rosen Crantz' or anything like that and none of the classic dialogue from the play is worked in just for posture. The filmmakers obviously had fun with the concept, and the result is a very likable drama/thriller with great performances. Image Transfer Review: The full frame transfer here is extremely well done. It lacks any signs of compression artifacts or unwanted shimmer. Colors are very well balanced with black level, which is also good. The film continuously impresses with its fine translation of the extremely dark cinematography. While it's typically recommended that you watch films in dark conditions with very low ambient light, I would say it's required here. Though it might seems like a widescreen transfer was left off, 1:33:1 is the original aspect ratio. Audio Transfer Review: The Dolby Digital 5.1 soundtrack is good, all around, but given the mostly dramatic nature of the film, there isn't a whole of action. The film is primarily front-channel loaded, with most of the sound effects and directional effects sitting there. Dialogue is very clean and crisp and never drowned out or off balance with other channels. Surrounds are mainly used for ambient effects and the musical score, but this is done very well for most of the film. Overall, the soundtrack is one of those enveloping style 5.1 mixes where, despite the lack of action, each scene sounds very lively and movie-like. Extras Review: Other than a collection of trailers, the only significant feature to this disc is a short behind the scenes segment. This feature isn't promotional or narrated, but simply uncut footage of the filming of the movie. It makes for fun viewing, though, as it highlights how some scenes were made as well as some of the interaction between cast and crew. The menus are nicely animated and stylish, but the general presentation is rather misleading. The photos of the back of the keepcase, as well as in the menus, seem to highlight strippers and people with guns. These elements are actually VERY minor to the substance of the movie. 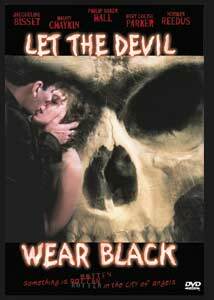 Let The Devil Wear Black certainly won't win any major awards or vast critical praise, but in some ways that's too bad. Devil drops the pretentious aspect of a name-brand cast or special "guest appearances" by certain actors, which seems to be typical of modern Shakespearean updates. Instead, it delivers a very entertaining, core update of the material. Highly recommended.